In 2017, the United States Agency for International Development Bosnia and Herzegovina Mission (USAID/BiH) commissioned IMPAQ International (IMPAQ), under the Monitoring and Evaluation Support Activity (MEASURE-BiH), to conduct the National Youth Survey in Bosnia and Herzegovina (NYS-BiH). NYS-BiH provides insights into the state of BiH youth, examining their perceptions, attitudes, and experiences on relevant topics including education, employment, inter-ethnic relations, political and civic participation, and migration intentions. This report presents the main survey findings from NYS-BiH and information on the survey methodology. 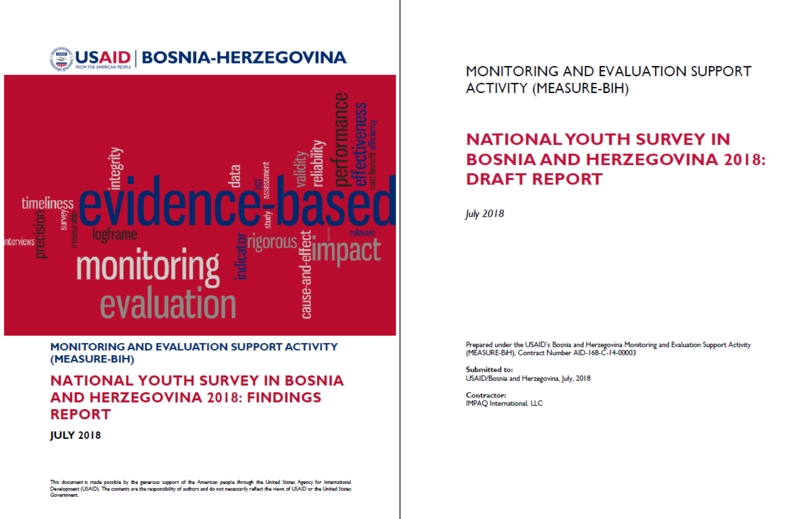 The analysis presented in this report is based on 3,002 respondents from 15 to 30 years old, as this age group corresponds to definitions of youth prescribed by the Federation of Bosnia and Herzegovina (FBiH) and Republika Srpska (RS) legal frameworks.